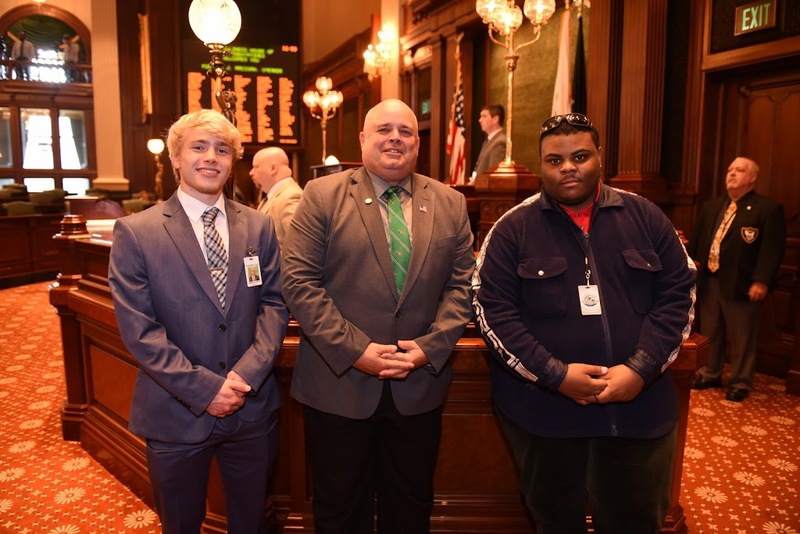 State Representative Dan Swanson hosted Cambridge resident Brockton Reed as an Honorary Page in the Illinois House on Wednesday, May 10. Brockton is a student at Cambridge High School where he is an active participant of Football, Basketball, and Track and Field Teams. He is also active in FCA (Fellowship of Christian Athletes), LEV (Leadership Ethics Value), NHS, FFA, FCCLA (Family Career Community Leaders of America), Spanish Club, Robotics Club, and Scholastic Bowl. He is a member of 4-H and a junior volunteer at Hammond-Henry Hospital. Brockton is also an Illinois State Scholar (2017-2018), won 1st place for FFA Section 3 Interview, Academic All-Conference (Football, Basketball, Track & Field) 2013-2017, was awarded the Quad-Cities Times Salute to Academics Leadership Award, was a Varsity Letter Winner 2013-2017 and was awarded Track & Field Most Varsity Points/ Most Versatile in 2015.